What day of the week would you prefer? 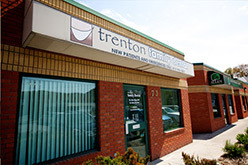 Your first visit to Trenton Family Dental involves a few special steps so that we can get to know you. To understand what to expect, please read through this page. You’ll find all the practical information you need, such as a map and directions to our office, practice hours, payment options and more. There’s also background information about our committed staff and our first visit procedures. You can also save some time by printing out and completing the patient forms in advance of your appointment. Being well-prepared for your appointment will ensure that your doctor has all of the needed information to provide the best possible care for you. It also will help relieve any unnecessary anxiety you may be feeling. Educate yourself on your symptoms by reviewing the content on this web site. Also, take some time to review our staff page and familiarize yourself with the doctors. We look forward to your first visit. We provide a financing option for patients who either do not have insurance coverage or are looking to get treatment above their insurance coverage. Health smart financing is on approved credit and payable over 12 months at 0% interest. Click the Health Smart button to apply now!